Colorado citizens learned their lesson from the Summitville Mine Disaster of 1992-93, but the state courts and legislature did not, and have repeatedly invalidated local laws that communities enact to protect their citizens from hazardous business pursuits. Colorado citizens are now gathering signatures to get Ballot Initiative #75, a groundbreaking constitutional amendment, onto the state wide ballot in November. Business interests have called Initiative #75, also known as the “Right to Local Self-Government” or the “Community Rights Amendment,” an “anti-fracking” initiative, but the measure confers more protection on Colorado citizens than just an anti-fracking initiative, and there are some very solid recent history lessons that are driving Colorado citizens to push for this initiative. One of them is the Summitville Mine Disaster of 1992-1993. The Summitville Mine, operated by the Summitville Consolidated Mining Corporation, Inc. (SCMCI), was an open-pit gold and silver mine located in Colorado’s San Juan Mountains, about 40 miles west of Alamosa. SCMCI used a cyanide heap leaching technique to extract gold and silver. The process involved excavating ore from the mountain, then crushing it and placing it onto a 1,235 acre open leach pad lined with clay and synthetic material. The company then poured a sodium cyanide solution over the crushed ore to leach out gold and silver. The contaminated water was collected and held in leach ponds on the mine property. Sodium cyanide is highly toxic, and among the most rapidly-acting of all poisons. The Summitville Mine sat at the headwaters of the Alamosa River. In 1986 a leak was discovered in the mine’s leach pond liner, and by 1987, SCMCI had had at least 8 toxic spills. In September, 1990, after the U.S. Environmental Protection Agency (EPA) received several anonymous phone calls, EPA officials visited the site and penalized SCMCI for toxic releases. The company paid $130,000 in fines, but didn’t stop polluting. Despite attempts to repair the liners, tens of thousands of gallons of highly toxic, polluted water leaked through into the ground, contaminating aquifers and waterways. The EPA finally served SCMCI with a Cease-and-Decist order, and the company agreed to devise a cleanup plan and start cleaning up the site by November, 1992. But in December, 1992, SCMCI abandoned the site, filed for bankruptcy, forfeited the $3 million in bond money they had paid to the government and walked away from the whole mess. EPA estimated that the mine was leaking cyanide-contaminated water at the rate of 3,000 gallons per minute. 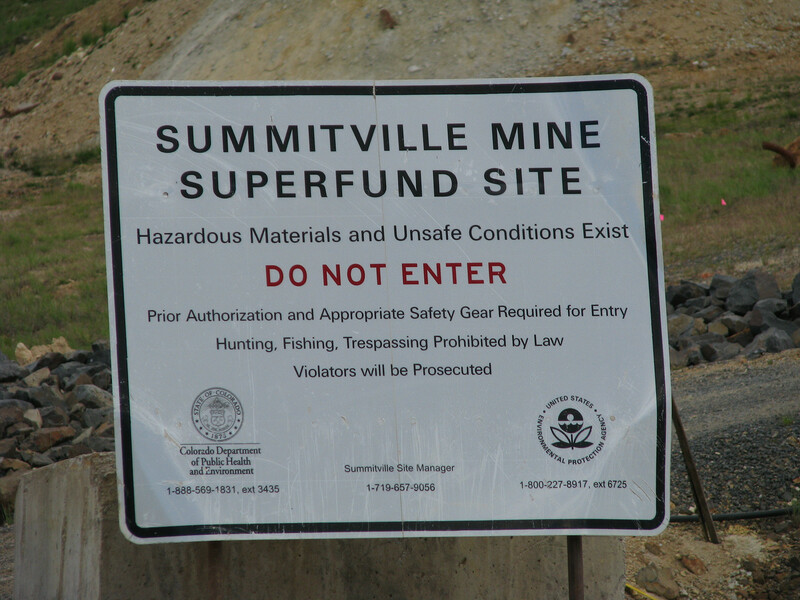 The Summitville Mine became a Superfund site, forcing taxpayers to foot the bill for cleanup, which to date is estimated at $150 million. 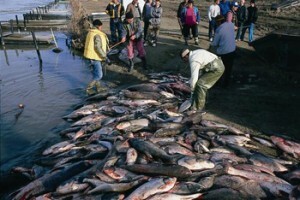 In 2000, a cyanide spill from a Romanian gold mine poisoned 250 miles of the Danube River and its tributaries. The spill contaminated the drinking water supply of up to two million people. Toxic leaching from SCMCI’s Summitville mine destroyed all aquatic life in the Alamosa River for 17 miles downstream, and poisoned reservoirs filled by the river. As much as 70 miles of river downstream from the mine site suffered from the spill. 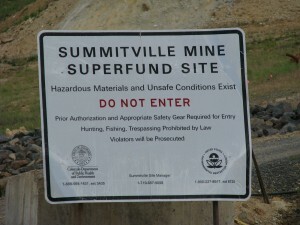 The Summitville Mine Disaster has been called the worst environmental disaster in Colorado history. After Summitville, the state legislature enacted stricter oversight rules for mines using toxic chemicals, but refused efforts to ban cyanide leaching entirely. to protect citizens from dangerous for-profit pursuits, even after a gravely serious disaster, and that when citizens take action to protect themselves, their efforts are thwarted by the Courts. Thus Ballot Initiative #75 was drawn up to enable people to protect themselves from dangerous, hazardous or noxious business pursuits. It will give citizens the power to decide which enterprises they are willing to tolerate in their own backyards. This constitutional amendment would give cities, towns and counties the right to ban hazardous enterprises, like cyanide leaching mines, construction of fertilizer or chemical plants, hazardous waste dumps, concentrated animal feedlot operations with waste ponds, drilling and fracking, etc., from within their borders, and would make citizens — not corporations, courts or the legislature — the final arbiters on what enterprises they are willing to tolerate in their areas.